Ask any business owner (small, medium or large) about the top challenges to running a business these days and it’s likely that hiring top quality people will be high up on their list. It is especially difficult when you throw in the ‘seasonal factor’ in businesses like Anna’s Gourmet Goodies. This past holiday was a record season by a large margin and once again, we were blessed to have some great people show up at just the right time. Thanks to a presentation by Henry Casey at this year’s NC Specialty Foods Fall Conference, I was inspired to reach out to Wake Enterprises to help us solve some production challenges. Not only did they come through with superb quality, it felt good to have them on our team. I first met Henry at a Raleigh Chamber of Commerce event years ago. I outsourced assembly of some DVD products for another business to Wake Enterprises and had a great experience. But I had not thought about having them help us with shipping boxes until his presentation. Turns out it was the perfect solution. Wake Enterprises was founded in 1979 and serves adults with intellectual and developmental disabilities. Their mission is to assist people with varying levels of abilities achieve their maximum potential through vocational training, job placement and community inclusion activities. By contracting with businesses to provide sub-contracting services, Wake Enterprises offers adults with disabilities the opportunity to learn valuable job and life skills to help them become more self sufficient and find a place in the workforce where they can contribute value. At Anna’s Gourmet Goodies, we bake and ship cookies year round, but the Holiday Gift season gets a little crazy. It’s like a big math equation where we have to figure out how many cookies we can bake and ship in a period of about 3-4 weeks. Of course this requires coordination of all the materials that go into our products – labels, ribbons, flour, butter, eggs, chocolate and lastly, shipping boxes and cards with envelopes. We’ve developed a relatively sophisticated capacity planning tool that helps us calculate to the cookie, what we’ll need to bake and ship orders for any given day. Although some companies order early, we find that most of the order rush actually happens just after Thanksgiving. This year we were looking at roughly 90% capacity a week before Thanksgiving – a good but scary problem. 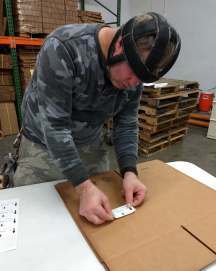 Fortunately, we were able to outsource our shipping box and envelope assembly to the team at Wake Enterprises. You might be tempted to think that our choice of working with the team at Wake Enterprises was based solely on a desire to include their adults in our process. That would be false. Having been in business for 17 years, we know that the only way to sustain our customers is to continue to provide top quality products and services. Henry assigned our project to Sylvester Kitchen, Assistant Director of Production & Procurement at Wake Enterprises. Sylvester served in the Army, NC National Guard and left as a Sergeant (thank you for your service). He has the skills to not only run top quality production processes, but the heart of a giant for serving others. He also volunteers with the Special Olympics helping Special needs Kids & Adults from 6 to 65 years of age. Ask him why he does what he does and the sparkle in his eye tells the whole story. To get us started, we dropped off a small order of about 150 boxes and 500 or so envelopes to be assembled just after Thanksgiving. A few days later I returned to pick up the order. Everything was ready and put together with the quality and attention to detail we expected. One of the team members, John, helped load the boxes into the truck. 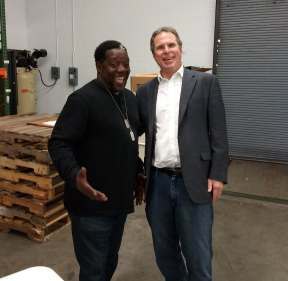 He didn’t say much, working quickly and as professionally as any one I’ve met at any warehouse or loading dock. There were several other team members there helping out, all of whom seemed excited about the work and eager to help with more boxes and envelopes. 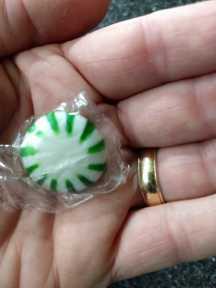 When we were finished, John walked up and quietly handed me this mint and said ‘thank you’. I later asked Sylvester if this is something John regularly does. “No, not really. Just sometimes.” I felt like I was the one who received a gift that day. At Anna’s Gourmet Goodies, we use the word laginiappe (pronounced lan – yap) a fair amount. It’s Cajun for a ‘little extra’. We try to think about this in everything we do for our customers. It made me smile and hold back a little tear to know that we found a business partner in Wake Enterprises that has the same attitude. We immediately placed another order and a few days later, the Wake Enterprises truck delivered a huge load of assembled boxes we used to ship orders throughout the entire Holiday Season. Our goal at Anna’s Gourmet Goodies is to make every recipient of our cookie and brownie gifts feel good. Not just during the holiday season, but throughout the year. If you sent gifts from Anna’s Gourmet Goodies to anyone this past season, you can rest assured that everything in that package was put together with love and a passion for quality. And you can feel good knowing that Henry, Sylvester, John and the rest of the team at Wake Enterprises, were all a part of that gift.